A new exhibit conceptualized, designed and realized by Charles and Ray Eames in 1961, will open Sept. 23, 2017 at Henry Ford Museum of American Innovation. "Once you drop into the Mathematica matrix, you will sense math all around you," announces the museum in Dearborn MI. "Mathematica is just as wonder-inspiring now as it was in the 1960s. Novices and prodigies will make new connections, from the conceptual to the aesthetic." "Bubbles that seem impossible, ball bearings that mimic orbiting planets and a machine that renders probability theory as visible—awaken the relationship between math and the everyday world. Count on full-STEAM-ahead learning, with the Eameses’ legendary elegance and levity." Originally created through funding by IBM—Mathematica uses kinetic installations, models, timelines, quotations, imagery and physical interaction to explain mathematical principles, phenomena, ideas and applications. The Eames office created three versions of the exhibition, including one for installation in IBM’s vast pavilion at the 1964 New York World’s Fair. The first is now installed in the New York Hall of Science and the second is owned by the Museum of Science in Boston. 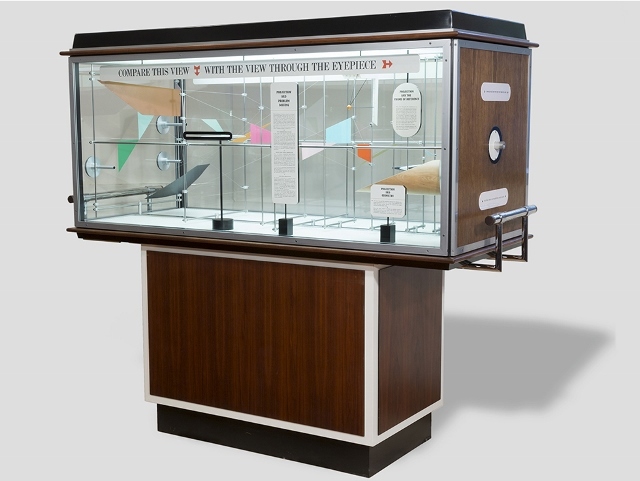 The third version, which will be at The Henry Ford, includes interactive elements and was originally on display at the Pacific Science Center in Seattle before becoming the property of the Eames family. The Henry Ford earned IDSA's Specai Award in 2016.